In a double boiler set over simmering water, melt the chocolate and cocoa powder along with the butter. Remove from the heat, stir, and transfer the mix to a large heatproof bowl. Add the sugar and vanilla and combine with a spatula in a circular motion. Slowly add the egg yolks, one by one, mixing very well after each addition. Fold in the broken cookie chunks. If adding pecans, fold them all in as well. You will have a moist and chunky, rough looking mix. Cut 2 pieces of waxed or parchment paper of about 15" length. Spoon half of the mixture onto each piece of paper. Shape them into logs with your hands and roll them in the paper to give them a salami shape of about 2" thickness. Having the paper cover makes it easy to give them a quick roll to give them a round shape. To finish, twist the ends of the paper in opposite directions. Wrap each one in a layer of plastic wrap. Place them in the freezer for about 2 or 3 hours or until frozen. If you wish, roll each log in confectioners’ sugar before slicing to make the slices resemble salami. Slice them as thin or thick as you like, while frozen, and serve. Chocolate salami will keep in the freezer, tightly wrapped, for about 6 months. Remove from the freezer about 10 minutes before you want to slice it. If you want to give them as gifts, you may want to buy colored paper to give them a festive feel. Though, I also like to use brown unbleached parchment paper - it gives them a deli style. 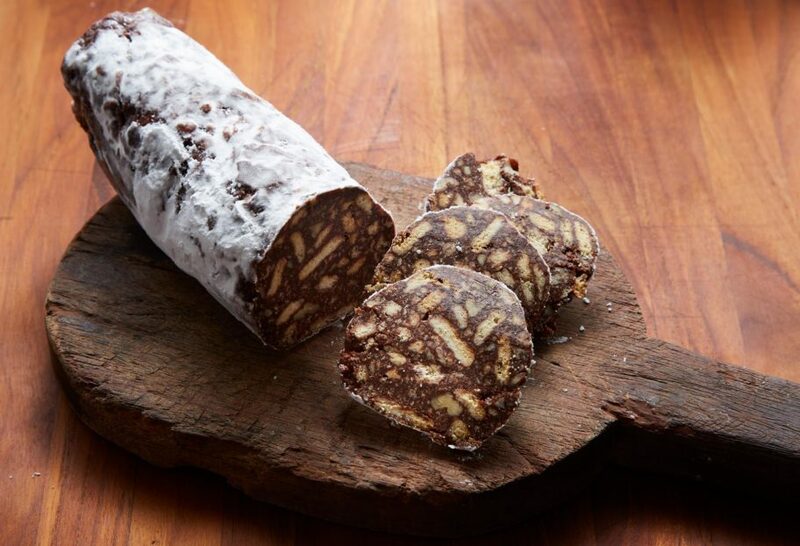 In any case, if you traveled with them for a while, don't forget to tell your friends to place the chocolate salamis in the freezer or refrigerator as soon as you give it to them(!). I made these cookies for my office Christmas cookie competition, and guess what? It won both the best tasting and best decorated cookies! I was beaming. Thank you, Pati! YAY!!!! Congrats on winning, Patty. Hey Pati I love your show and I have both of your cook books . I’m wondering is there a way to veganize the recipe as I am vegan and I really want to try it ! I’ve tried many of your other recipes and veganized them and they are great ! Oh you can use your favorite vegan egg substitute in the recipe. Enjoy Brooklyn! These turned out great! I found Maria cookies at Aldi last night and made them today. I decided to not chance the egg yolk and substituted flax meal with water. I made 5-6 logs and they are in the freezer. Thanks Pati for the great idea! As I was making them I was thinking of the cinnamon chocolate flavors of Mexico and wondered how you would suggest to modify that to capture that flavor in these? Oh you can add cinnamon to taste to the recipe if you like, Jenny! I love your recipes! Still need to make your guava cheesecake. Everything I’ve made has been delicious! Muchisimas gracias!! Can I substitute mexican chocolate for the bittersweet? Como abuelita de barra or Ibarra? Of course change the sugar quantity…just a thought. Hopefully I get another one of your cookbooks for Christmas! I recommend using the bittersweet for this recipe, but you can try it with the Mexican too, you may just want to adjust the sugar. What are maria’s Cookies and is there a substitute? They are a cookies originally from Spain that you can usually find in the Latino/International food aisle of your local market. If you can’t find them, you can use vanilla wafers or plain Graham crackers. Enjoy, Boni! I happened to come across them at Aldi last night. do the raw eggs pose a threat? Oh the residual heat of the melting chocolate cooks the egg yolks just enough, Lynn. I’m trying to make the chocolate salami. Oh they are a type of Spanish cookie. You can find them in most grocery stores, usually in the international food aisle…but if you can’t find them, you can substitute with vanilla wafers or plain Graham crackers.